Swainson's first great voyage was to Brazil from 1816 to 1818 - he returned with thousands of drawings and samples of animal and plants which became the basis for Zoological Illustrations (1820-23). 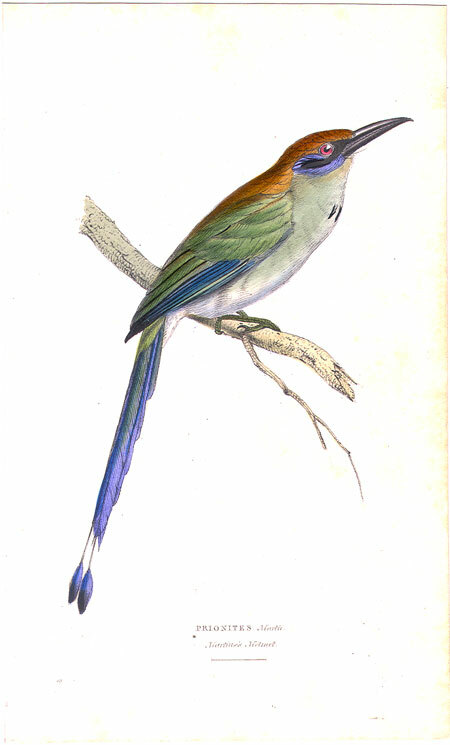 Later works include Works include "Ornithological Drawings of Birds from Mexico and Brazil" (1831-41) and together with Sir John Richardson a study of North American birds "Fauna Boreali Americana" (London, 1829-37). In 1841 he emigrated to New Zealand to become a farmer. Swainson was a pioneer in the use of lithography for natural history illustrations. He was a friend of John James Audubon who named Swainson's Warbler after him. For more information about the fascinating life of William Swainson, we recommend the biography on the Encyclopedia of New Zealand website. Condition: Very good. Light age toning and a few very faint and tiny spots.